← Engineering, Divergence, and global growth weakening. Ever since 2008 policy, markets and the economy, have been reflecting a new paradigm, which is shown in the chart above. The trend in GDP growth to federal debt issuance reversed decisively down in 2008 and the trend has continued to decline relentlessly. “From 2008-2017, GDP grew by $5.051 trillion, from $14.55 trillion to $19.74 trillion. During that same period, the increase in TDO (Treasury Debt Obligations) totaled $11.26 trillion. In other words, for each dollar of deficit spending, the economy grew by less than 50 cents. ​We can already see the beginning of this new acceleration of debt. It needs to be understood by investors that without massive Federal debt growth since 2008, and the government spending that goes along with it in the GDP statistic, there would have been no growth at all since 2008. This has never happened before! Beyond this the economy has been “blessed” with the lowest interest rates in history with years spent at near zero interest rates. From the end of 2015 interest rates began to rise but only slightly. Despite all this record stimulus, the post 2008 recovery has been the weakest since 1945. As shown above the debt binge isn’t stopping because economy is doing so poorly without the debt. So policy makers are committed to ever expanding government debt as it seems to be a “necessity” and the recent tax reform bill helps in that regard. Are there limits to this ever expanding debt? Will the runaway freight train of debt become derailed at some point? Yes, and this concept also needs to be understood, as it may help us gauge when the freight train will come off the rails. “If the interest rate paid by the federal government were to double to 4.92%, which is still low by historical standards, the Solvency Ratio would be 30.7%. The Tipping Point would be reached even when assuming that the federal government does not borrow more than it is forecasting”. So now we begin to have some parameters on interest rates, as well as debt to define the boundaries that are beginning to limit the Fed. 1. The US economy has operated completely differently from the past ever since 2008. Not only has the recovery been the weakest since 1945, but it has been wholely dependent on Federal Debt. 2. Low interest rates have been an essential element of perpetuating the system. So much so that now interest rates are capped at 5% for the solvency ratio to remain under the 30% tipping point. This rate will fall over time. 3. 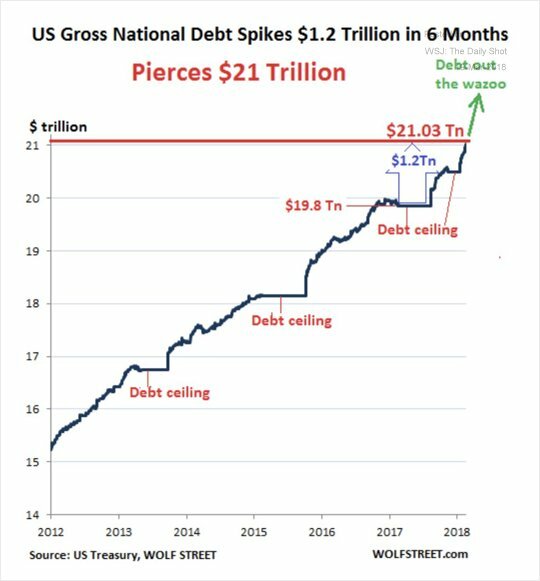 Federal debt expansion, however, must continue as there is insufficient underlying growth to service the ever expanding debt. This is obviously not a winning game plan, as even greater debt will further weaken long term growth, as it has for 4 decades already. Already each unit of government debt only produces ½ a unit of GDP. 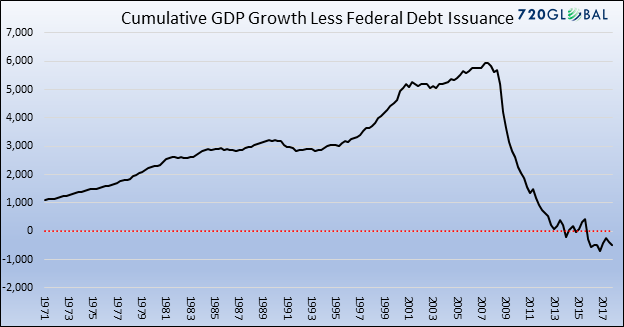 This ratio of GDP growth per unit of debt will likely fall over time, with the growing debt burden on growth as well as the falling efficiency of deficit spending. 4. In the next recession the Federal Reserve may not have room for enough interest rate cuts to turn around the real economy. It cut interest rates by around 5% in 2008/09, and must keep interest rates below 5% in this cycle to avoid the hyperinflation tipping point. Any ceiling below 5% may not provide sufficient room for interest rate cuts to turn around the next recession. For the first time the Fed has to consider the very real prospect that it will not have sufficient tools to get the economy out of the next recession. 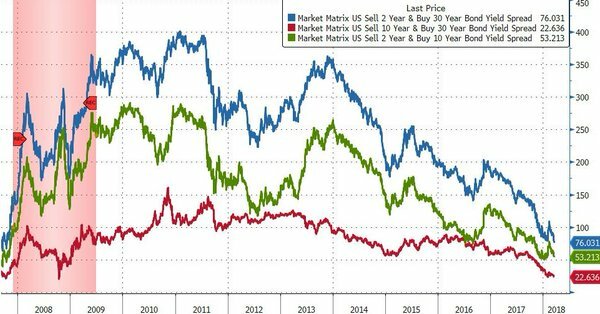 As the chart below shows, the Treasury bond market has already flattened the yield curves to the same levels that existed just before 2008, even at much lower interest rate levels. So the peak level for interest rates may not be far above what has already been priced in. ​This is corroborated by a recent peak in GDP globally. It appears that both fiscal and monetary measures have entered their endgames. This is perhaps less surprising than one might think. Over history few monetary systems have lasted beyond a few decades. The list of quotes and experience about the temporary nature of any fiat money system has a substantial history. While the endgame looms there are still many paths to that point and the Fed can still choose the path. However, the Fed is becoming increasingly limited in its options as the boundaries of the endgame have begun to close in on what is possible. There are numerous asset allocation consequences that result from these insights, which will need to be thought through carefully, but it all starts from a good understanding of why policy makers and the Fed are now just playing out their endgame. We can now see the limits of the game being played out so that we are now on notice of major changes in the monetary system. In the end these changes just need a critical mass of capital to lose confidence. This could take years or happen at any time. Martin Armstrong has studied these developments throughout history and the stage at which these factors become critical does not come from the metrics discussed above but from a change in confidence in the system. Investors should no longer wait to make preparations for significantly different financial conditions.